Phone 999-1075 for more information. 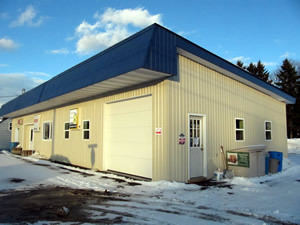 We are open BY APPOINTMENT ONLY. We strive for a cage-free environment. Cats are caged when they first arrive at the Adoption Center. They are given exercise play time out of their cage. When it is determined they can get along with other cats, they are moved to one of our social areas. In two of the rooms there are tracks with tunnels and levels where the cats can get up high if they feel the need. 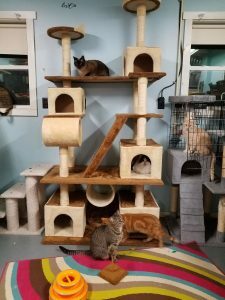 Photo at left: One of our social rooms with cage doors open and a large community cat tree.